In the middle of a UK tour, David Ford has released an EP called The Union which is currently only available at the shows he's performing with Michele Stodart and JP Ruggieri. The five-track EP is a taster for his new album Animal Spirit that's due later in the year. It's unmistakably Ford and will delight those that have followed him for close to a decade and a half, but has the potential to win him new admirers. Telephone is one of those magnificent widescreen ballads that Ford does ever so well. For a one-man band he's had a knack of creating this big bold ambitious songs throughout both his Easyworld and solo career. Telephone has dark slightly menacing verses, softened by strings in parts before the chorus comes in with crunching powerful guitars and soft tear-jerking vocal harmonies as he implores the song's subject to answer their phone. Perfect Day is a joyful song, which sees Ford uncharacteristically happy, as he muses over the day that he and his wife went to get the first scans for their (then unborn) daughter. It's a beautifully tender account "hey, hey, there's has been nothing like today, my whole world has changed in a heartbeat" which is full of cautious optimism. Timber To Ashes is a slightly Americana tinged ballad that really shows off the expressive nature of Ford's voice, often subjugated to his instrumental gymnastics, but showcased here to stunning effect. Somebody Other Than You is a third-person observation of a relationship situation that he's become very adept at expressing, the pathos in the opening line setting the tone - "darling, I'm still around if you still want me I can always be found in somebody's arms, somebody other than you, what the hell else can I do" - for a world-weary resigned reflection. 100 Streets has all the drama you'd expect from a film soundtrack, and, surprise surprise, it is the title track from a recent movie and will already be familiar to Ford fans although this version demonstrates a little more restraint. In recent interviews, Ford has intimated that he's written fifteen songs in the three years since his last album Charge and that the five on this EP are those that didn't fit together with the ten that will make up Animal Spirits, an album that he's talked about being based around macroeconomic theory, an unusual subject matter but one that's strangely relevant in these bizarre times. In that context, The Union EP makes perfect sense - it'll delight Ford fans and provide an interesting smorgasbord of what he's capable of to those just discovering him. 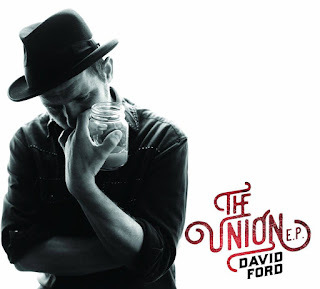 David Ford plays Southampton Talking Heads (16), Leicester Donkey (17), Manchester Deaf Institute (18) and Leeds Brudenell Social Club (22).